It’s no secret that “Ice Age 4” has received a lukewarm, if not frigid critical reception, but silly critics, “Ice Age 4” is for kids! Grownups might rather stay home and watch “The Artist,” but it might warm their hearts to know that “Ice Age 4” is lively and fun to watch. The environment in which the characters find themselves, with plate tectonics shifting the world’s land masses, is inhospitable, but the characters themselves are not. While there’s no mistaking that this is a sequel, with that unshakeable feeling of picking up where we left off and landing in the middle of something already in progress, “Ice Age 4” melts away the inevitable low expectations its audience might have for it by this point in the franchise. For starters, the opening is priceless, with Scrat the squirrel up to his usual oblivious antics in his relentless search for acorns. This time, his pursuit changes the face of the planet, and all prehistoric peril breaks loose. This fourth installment finds the familiar trio of Manny the Mammoth (Ray Romano), Diego the sabor-toothed tiger (Denis Leary), and Sid the sloth (a lisping John Leguizamo) struggling to find their way home as the continents divide. They are stopped in their watery tracks when they encounter the primate pirate Captain Gutt (voiced with delicious malice by Peter Dinklage). Pirates in the ice age give new meaning to “shiver me timbers.” True, the pirate theme has been done to death and should probably be forced to walk the plank, but kids never get tired of it, and there’s not a children’s series in existence that hasn’t taken advantage of it. The storyline is perhaps nothing special. “Ice Age 4” is all about silliness, but the goal was never to have the depth of a Pixar film. It’s all about making kids bust a gut (even naming a character after the same). Mission accomplished with mildly rude jokes like Sid’s shocked “Holy crab!” reaction at yes, wait for it, a giant crab. Maybe I’ll be the lone voice in the arctic wilderness for liking it, but it wouldn’t be the first time. Thank you for that in-depth review. 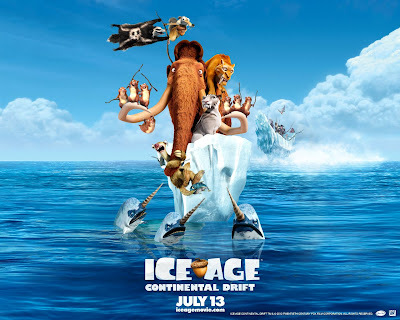 Based on your thoughts, Ice Age 4 seems to be a general fun time for a great outing with the kids. I’m not a fan of the cynical-type humor but I love that they’ve kept the movies all about bringing smiles to the faces of children and the parents that bring them to the theater. Finally a review that mets me decide whetrher to take my kid to the movie. Most useful.